Middle neighborhoods have an imprecise definition, in part because neighborhoods have imprecise boundaries. Even so, we can understand them through two entry points: income and home value. Middle neighborhoods are typically home to households earning within a modest range (generally 80 to 120 percent) of the county or metropolitan median income. Home prices generally hover around the median sales price. But this can vary. In Philadelphia, middle neighborhood home prices ranged from about 50 percent below to 50 percent above the city’s median home sale prices, according to Reinvestment Fund data. They are home to a large portion of the American population. In many cities, up to 40% of residents live in middle neighborhoods, according to Reinvestment Fund data. 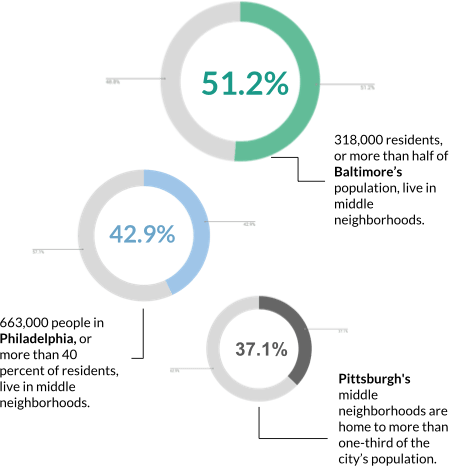 Census figures show that middle neighborhood residents have higher-than-average rates of voter turnout, home ownership and education attainment. They provide a critical tax base to fund basic services. The large percentage of residents living in middle neighborhoods pay property taxes that serve as a major source of municipal fiscal health. When property values decline, local and state governments lose an important revenue base. Frequently, declining revenues translate into a cut in essential services — trash pick-up, local safety, reduced public-transit schedules and more. They provide significant opportunities for upward mobility. Middle neighborhoods are reasonably affordable, stable and safe. Schools are decent and rents are modest. Historically home to middle- and working-class families, including new immigrant populations, middle neighborhoods are also bastions of homeownership, places where newcomers play the odds in the hopes that the neighborhood, and home values, will improve rather than decline. They offer pathways to racial wealth equity. Large percentages of people of color live in middle neighborhoods. Stabilizing the housing market has a positive impact on intergenerational wealth-building. And eliminating disparities in homeownership is one of the most powerful ways to narrow the racial wealth divide. They are strongholds of diversity. Middle neighborhoods tend to be more racially and economically diverse than wealthy or poor neighborhoods, and more diverse than their cities as a whole. With increased polarization across economic, racial, and political spheres, middle neighborhoods are strongholds of diversity, where people of varying standpoints interact with and learn from one another. More than 42 percent of Philadelphia’s middle neighborhoods are racially and ethnically mixed without any one predominant racial or ethnic group, according to Reinvestment Fund data. But they are largely underfunded. Lending institutions often overlook middle neighborhoods, and residents increasingly struggle to bridge the financing gap for home upgrades and maintenance. A recent analysis of mortgage-lending data from the Consumer Financial Protection Bureau found that traditional banks have “almost completely” abandoned the types of loans favored by working-class borrowers. Middle neighborhoods don’t find sustained support by large-scale philanthropy either. Resources are often channeled to more distressed areas, and when viewed in comparison, middle neighborhoods evoke an image of relative prosperity. They are omitted from policy measures. Annual federal allocations from the Community Development Block Grant – a critical source of flexible community funds – peaked in 1995, but have steadily decreased, according to HUD data. This Urban Institute chart shows how federal subsidies to promote asset building do not benefit lower- and middle-income families. Middle neighborhoods deserve our attention now. An ounce of prevention is worth a pound of intervention. Investing in middle neighborhoods before they decline is easier, cheaper, and more effective. Limited resources often are directed to distressed neighborhoods where need is more acute. But findings suggest that investing in parts of a city where more distressed neighborhoods are adjacent to middle neighborhoods – where communities can “build strength from strength” – produces higher returns and better social outcomes for all. Here are five strategies to strengthen and stabilize middle neighborhoods. 1. Increase access to capital. Expand lending resources and cultivate partnerships to reinforce real-estate and job markets. In Baltimore, Healthy Neighborhoods, Inc., provides funds for middle neighborhoods stabilization through a loan program with no income restrictions for applicants. Engage with community and neighborhood leaders to document best practices and translate knowledge into accessible tools and stories. A national community of practice provides opportunities for ongoing exchange of knowledge and strategic interventions that stabilize and strengthen middle neighborhoods. 3. Tell the right story. Engage in brand and marketing strategies to attract new residents. Develop awareness of historical and economic contexts for middle neighborhoods. Partner with adjacent neighborhoods to build strength from strength. Chicago’s Greater Chatham Initiative aligns four neighborhoods as a single community, allowing them to compete more aggressively for funding among the seventy-seven neighborhoods that make up the city of Chicago. 4. Build an inclusive movement. Engage diverse community leaders, researchers, and policymakers to identify solutions and possibilities for collective advocacy. Focus efforts on advancing the robust work of neighborhood practitioners. 5. Bring middle neighborhoods into a citywide revitalization strategy. For cities with limited resources, investing in middle neighborhoods can produce the biggest returns. Local governments must place middle neighborhoods on a continuum of comprehensive development. Address public policies that undermine or marginalize these areas to demonstrate the national interest in improving middle neighborhoods. Calling attention and committing resources to the overlooked challenges middle neighborhoods face requires a holistic strategy that enlists citizens, community leaders and policymakers. 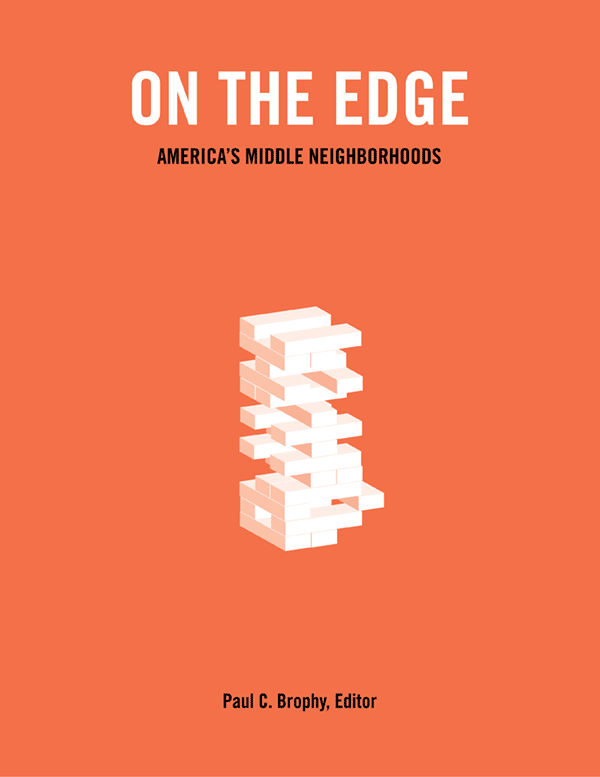 For an in-depth look at the people and policies shaping these communities in transition, read On the Edge: America’s Middle Neighborhoods, edited by Paul C. Brophy. Follow Next City’s Middle Neighborhoods coverage as we dig into the solutions and success stories that animate the conversation today. This slideshow is part of the Middle Neighborhoods series, supported by a grant from The American Assembly.